Recent researches in the MengCun Wu family records (家谱，JiaPu) have revealed that Wu Ying's (吴溁) initial given name was in fact Rong (荣), and hence Wu Ying was initially wearing exactly the same name as Wu Zhong's daughter (i.e. 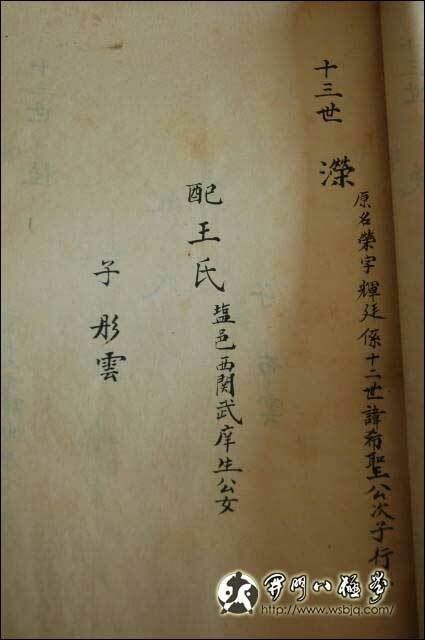 Wu Rong, 吴荣, see the section about Wu Rong). Wu Ying's given name was later changed to Ying (溁), probably when Wu Ying was adopted by Wu Zhong, in order to avoid confusion with Wu Zhong's daughter. Moreover, Wu Ying's style name (a given name that was given to chinese persons in the ancient times after they reached 20 years old, as a symbol of adulthood and respect) was Wu HuiTing (吴辉廷). "13th generation : [Wu] Ying (溁), original name Rong (荣), style name HuiTing (辉廷), related to the late [Wu] XiSheng (希圣) as a second son. Got married with a member of the Wang family : the daughter of the venerable Imperial officer in charge of the west pass of YanYi city. One son [Wu] TongYun (彤云)"
One should note that the Ying (溁) character in Wu Ying's name is a very scarcely used character, made of the Rong (荣) character on the right, and the water key (氵) on the left. This Ying character is only found in very comprehensive dictionaries, and is only used in a few locality names. Since Wu Ying and his father were students of the Imperial college during their lives, they benefited from a litterary education, and it can be supposed that when changing Wu Ying's name, the singular Ying character was chosen because its writing was similar to the Rong character but with a distinctive pronunciation. However, due to the rarity of the Ying character, most native chinese speakers have a natural tendency to pronounce it incorrectly as "Yong" or "Rong", based on the right part of the character which usually indicates the pronunciation in mandarine chinese. Due to these changes in name and to the confusing pronunciation, it appears that in some martial manuals like the PoBei and the LuoTuan manual, Wu Ying's name is incorrectly written as "Wu Yong" (吴永), using a character that is more commonly used as a given name. This is mainly because most BajiQuan practitioners and manual authors were country people who did not have the chance to have a litterary education. Moreover, when looking at the MengCun Wu family records, there is no person called Wu Yong in the generations around Wu Ying. Wu Ying was a Hui minority member from MengCun town. He was born in the 31th year of QianLong period of Ming dynasty (i.e. 1766) and died in the 2nd year of XianFeng (i.e. 1852). In his last year he was 87 year old and during his life he had been a student of the Qing dynasty Imperial College. Wu Ying started to train martial arts after some literary studies when he was a young. He was a bright and surpassingly clever person. Because Wu Zhong and his mother were adopted and protected by Wu Ying’s paternal grandfather (Wu YunMing) when Wu Zhong was a child, in his later years Wu Zhong felt grateful to Wu YunMing and adopted Wu Ying. As a consequence, Wu Zhong took great care to transmit Wu Ying the martial skills he had acquired. Since Wu Ying started to train martial arts, he was an assiduous student and became rapidly Wu Zhong’s favourite disciple. In the 55th year of the KangXi Emperor (1790), when Wu Zhong was 72 years old, he suggested Wu Ying to give the official name “Baji Quan” to the style and to compose for the first time a manual called “wushu” (武术, i.e. martial art) about the Wu family BajiQuan. This was done in order to give a fixed name to the martial art that Wu Zhong had initiated under the name of “YiShu” (异术, unusual style) and to keep an intact record of the style. The manual has been lost thereafter in the turmoil of war, but a fragment of its preface has been recorded, which says “After fearing that YiShu would disappear, BajiQuan was introduced…”. Wu Ying had a long but bitter life, his wife gave birth to one son called Wu TongYun, and died early. Wu TongYun contracted smallpox (a disease that was plaguing the CangZhou area during the 18th and 19th century), and died shortly after the birth if own son Wu Kun. As a consequence, Wu Ying had to raise and teach both his son and then his grandson to ensure the transmission of BajiQuan. Wu Ying had also an important role in the spreading of Baji Quan to the other families of MengCun village, like the Wang and Ding families, but also to the families of the nearby villages like LuoTuan which later produced some famous practitioners. It is to note that in this early period, the Wu family people already started to teach people from various kind of places and religious confession. Wu Ying accepted disciples like Gao MingShan, Li DaZhong and Zhang KeMing who were from the Han nationality and not originating from MengCun. Furthermore, in the generation after Wu Ying, his disciples belonging to the Wu family founded a school in MengCun to teach the Wu family BajiQuan, where both Han and Hui nationality people were always accepted. Before WuYing died, he respected his duty of an adoptive son and left the following last will : “to have an independent graveyard, not to be buried in the (Wu ) family tomb, to be the descendent of WuZhong for the later generations”(自立茔地，不入家坟，世为吴钟之后). As a matter of fact, Wu Ying was burried in MengCun in the small yard he had bought at the end of his life, together with his grandson Wu Kun and their descendants who died after them. This place, located in the north of MengCun town, has been preserved by the Wu family. Wu Ying's wife and son, who died early before him, were burried with the other members of the Wu family in a large grave yard located on the west of MengCun town (in front of the new training center), along the road that drives to SongZhuangZi village.